The Motorola Flipout comes with a custom Gallery app (like the XT720 one) with cool 3D effects, reflections and smooth animations. In terms of eye candy, we have no complaints. The Gallery is split into three sections – Camera roll (shows the most recent photos you’ve snapped), My tags (you tag photos to keep things organized) and finally – Folders. The Folders view combines all folders from the memory that contain photos or videos. Viewing a folder (be it the camera roll or another), photos are displayed as one long line of photos. You can scroll sideways to browse the photos and as you do, a label appears that shows when the photo (or video) was taken. From the menu option, you can set a specific point in time and the Gallery will scroll there automatically. The smooth animations sure are eye-grabbing but a boring grid view is much better at browsing a large collection of photos. Turn the phone on its side and it will switch to grid view. Of course, you can tag photos (including the automatic location tag), which will make viewing specific photos so much easier, even if you don’t take the time to meticulously organize everything into folders. Pinch zooming is also enabled here but you can use double tap too. The Quick upload and Share features offer quick sharing on Facebook, MySpace, Picasa and other photo sharing services, but also Email apps, Bluetooth and MMS. There are tons of options for a picture – you can resize, crop or rotate it directly in the gallery. You can also add effects, adjust contrast, saturation and also text, clip art and others. The quickest way to fix up a photo however is the Kodak Perfect Touch. It automatically fixes the photo – you don’t have to do anything. One thing missing in the Flipout Gallery that we would have liked is support for, say, TwitPic or another easy way to send out a tweet with a link to a photo, without having to first upload the photo then manually copy its URL and then write your message. Of course, the Android Market has many apps that do just that, but still. The video player itself is as simple and basic as it could possibly be. You can pick a video from the Gallery (with the cool 3D wall and everything) and tap play. Codec support is limited – DivX wouldn’t work, just XviD. And then only up to WQVGA resolution (400x240). Bigger files seem to need more processing power than Flipout can offer. Still, on a 2.8” QVGA screen you don’t need much more than that. The Music app on the Motorola Flipout takes the same route as the Messaging app – it puts all the music related things in one place. My Music is the basic music player – it plays songs from your memory card and it can filter tracks by artist, album, playlists and so on. A cool feature automatically pulls album art for the song and – get this – the song lyrics, which are displayed in sync with the song. This turns the Flipout into a mini karaoke (of course, it needs an Internet connection). A tap on the screen reveals the player controls or you can tilt the phone on its side instead. You can send a blip – a quick “Love it” or “Hate it” message on Twitter or Facebook. The Music Videos section of the Music app offers quick searches on YouTube or GoTV channels for the music videos (what else?). Community taps into the social networks to find you some new music. You can view TuneWiki charts, Music Maps (sort of location-aware “currently playing” feature) and HOT Playlists, which show the most popular songs on Facebook or Twitter. There’s a song ID feature of course – tap the button and in seconds you’ll know the name of the song. There are still some shortcomings of the music player that need addressing though. There are no equalizer presets, nor any alternative skins. The Motorola Flipout is equipped with an FM radio with RDS. The interface is simple – there’s a tuning dial and you can save as many as 10 stations as favorites. There’s no option to play the radio on the loudspeaker. If you get bored with local radio stations, you can listen to Internet radio too. There are plenty of stations to choose from, and in many genres. But you’d better have a solid data plan or a Wi-Fi connection as Internet radio will run up data charges. The Motorola Flipout did fairly well in our audio quality test and really managed to surprise us with its extremely loud output. When the handset is connected to an active external amplifier (such as a car or home stereo) it performs perfectly, save for the high distortion levels. All the other readings are easily comparable to the best among mobile phones nowadays. 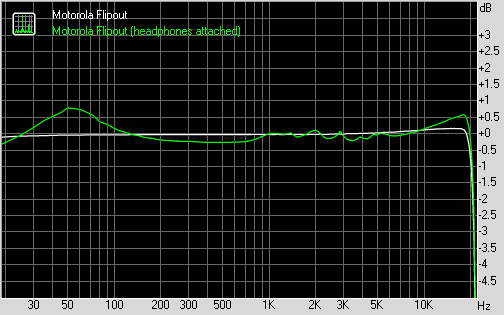 When you plug headphones, the frequency response gets a bit worse but its deviations still remain undetectable in all but lab conditions. The total harmonic distortion improves in such conditions but the intermodulation distortion and stereo crosstalk suffer a hit. Overall, we would say that the Flipout performed even better than we expected here.